I arrived with a throng of hip-dressed Hungarians, our eyes wide open as we entered the multicolored array of dance lights that can be seen all along the straight of the Danube. 7pm is, by far, the earliest many of us have ever been on the notorious party boat, who hosts concerts and events every couple of nights – a staple in Budapest’s night life. 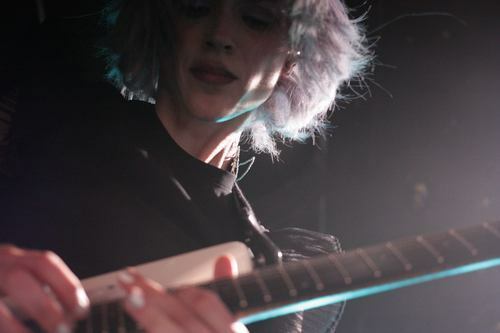 On October 18, as a part of cafe Budapest – a yearly autumn festival featuring contemporary art, music, and performances – St. Vincent graced the tiny venue with an electronic foray of musical magic. As the lights dimmed, a robotic voice appeared through the haze. It called to us as fellow analog listeners and urged us to refrain from “digitally capturing our experience.” Luckily, I was able to meet a lovely Lithuanian before the performance to capture the moments I would have otherwise lost due to my phone’s presence in my pocket throughout the show. The band came forth in tandem, the lights dark and dimmed by the fog-filled room. 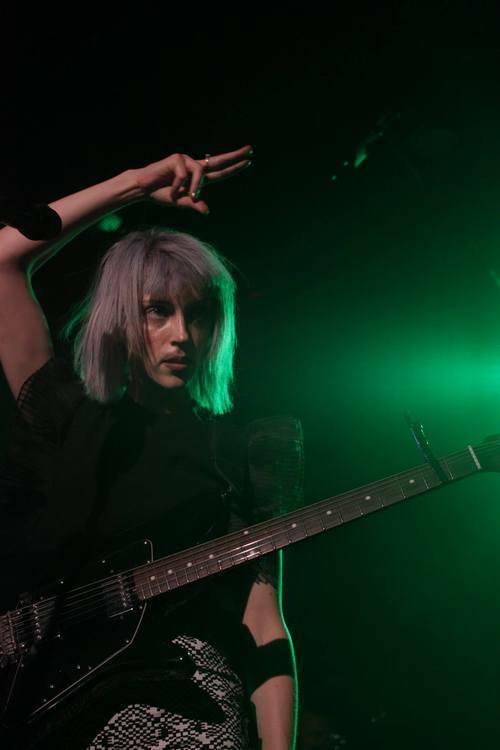 In a flash, St. Vincent began with “Rattlesnake” and “Digital Witness” – the lyrics of which matching perfectly with the earlier sentiment of experiencing the concert in person, rather than through the lens of a phone screen. After a brief pause, the soul-shaking guitar riff of “Cruel” rang through the air – its piercing alternations doubling that of the keyboard, just an octave below. 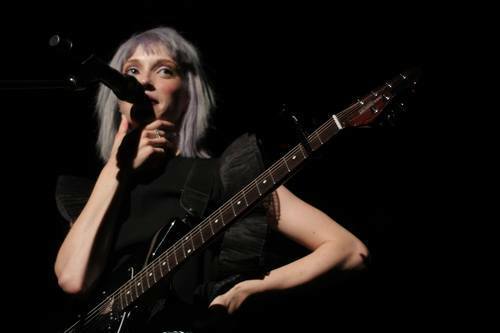 During this song, the contrast between the natural and unnatural established itself as a main theme of St. Vincent’s performance. As each song built upon the last, Annie Clark and her band moved more and more robotically until we all could recognize the synchronized movements as an integral part of the show. 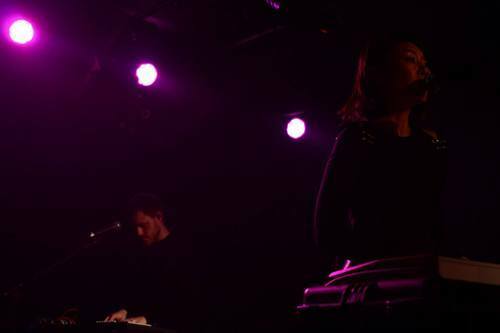 Through our screams of consensus, the keyboard and drums spelled out the opening notes of “Marrow” whose chorus, “H. E. L. P. Help Me. Help Me” rang through the mouths of two-thirds of the audience – demonstrating St. Vincent’s enormous following that must exist in Eastern Europe. After the show, I met with humans from all nationalities – Hungarian, Serbian, Lithuanian and the like. As we all intermixed within the 300 or so person crowd, we not only witnessed – but participated – in Annie Clark’s wildly orchestrated madness. A director of the stage, Clark waltzed around through strobes and flares. The band’s movements lined up with every beat, flash of light, along with each other. When the moment came for her to remove her instrument, Annie approached the stage crew and they fluidly made the change in a coordinated measure. Every time the lights blacked out, the crowd would erupt in a thunderous boom – the noise of the audience multiplied by the ship’s steel enclosure. As the lights came up onto the stage, the figure of St. Vincent stood asymmetrically in front of us. The music began to ebb and flow as “Jesus” began. The ballad broke the reoccurring pattern of digital imagery – the movements of the band and the lights behind them mimicking that of the wind or the ocean. 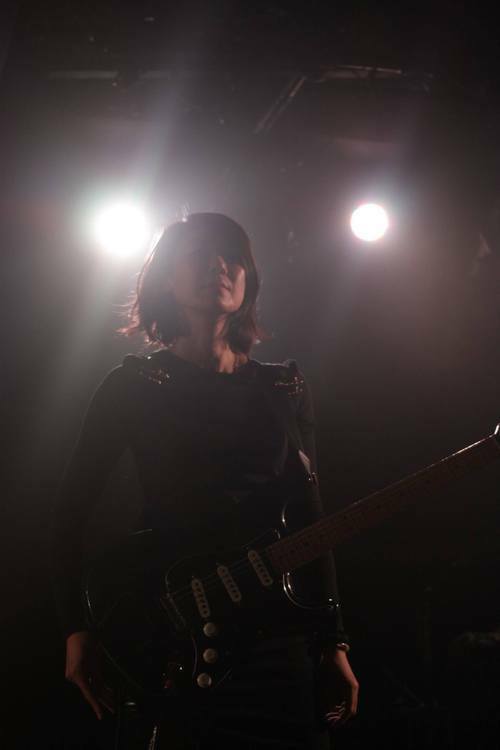 The natural sounds became distorted in the crescendos of distorted guitar riffs that introduced “Chloe in the Afternoon” – the keyboardist, Toko Yasuda, joining Clark with her punching electric guitar. 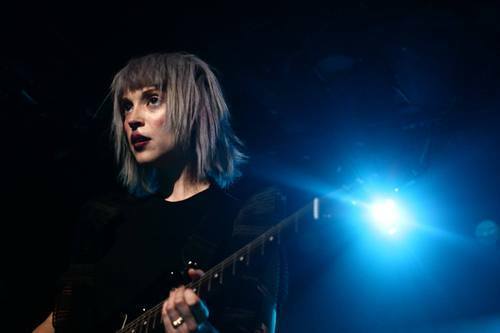 The song ended in a clustered mess of arpeggios and slammed strings, Annie approaching the edge of the stage multiple times to show off her ardent talents – playing the strings of the instrument like grass in a meadow. After waiting again for the crowd to quiet, Clark continued her story about the times we had in common as a child. She spoke of a fire that we built when we were younger, and “as we watched it burn, we knew we were supposed to be scared but…” she inquired deeply, her words appearing naturally although they were obviously a perfectly practiced insight. The set continued and, in-between the songs “Actor Out of Work” and “Birth in Reverse,” Annie Clark did nothing but amaze us with her skill and passion when the time came for her to play the guitar. The solos in “Surgeon” and “Prince Johnny” stood out as two the strongest instrumental moments I have ever heard. By the time “Birth in Reverse” tore through the speakers, the crowd was so riled up that the boat was literally shaking in time with the music. The band and the crowd sang in sync during ballads like “Cheerleader” – the natural colored lights blinding us until Clark had been reduced to nothing but a silhouette. Quicker than they came, the band snuck off the stage immediately after the final song. We chanted in a chorus for Annie yet their return to the stage only came after the audience dimmed its cheers in sadness that the show may already be over. Yasuda entered and smiled from behind a glass of water as Annie played from back stage. When Clark was finally illuminated by the light of the stage, she squinted over us into the back of the club’s smallest room before flying into the center of “Strange Mercy”’s complicated drum-line. At the end of it, she threw herself into the arms of the audience. Guitar in hand, Annie played above us. 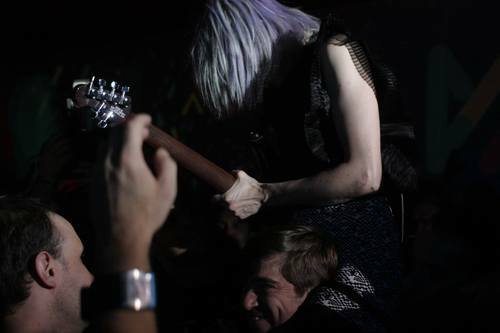 She passed off her guitar to the members of the front rows so that we could play for her as she held her head back in ecstasy. 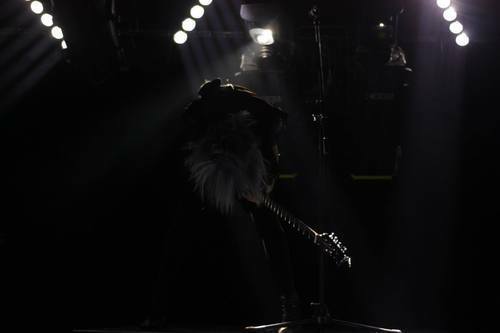 When she returned to the stage, the leading women fell to her knees and crouched next to the beat-up Stratocaster. 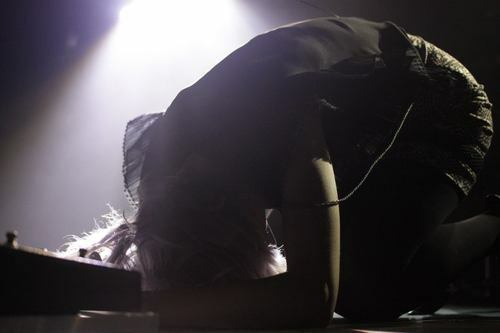 As she slowly lifted her head, a member of the stage crew adorned her shoulders with a new guitar, like a crown of thorns on a weary Jesus-like figure. She once again amazed us with her final solos strewn throughout the song, “Your Lips Are Red.” With the magic of the fourth wall already broken, nothing could stop us all from singing along and creating the music with the rest of the band. 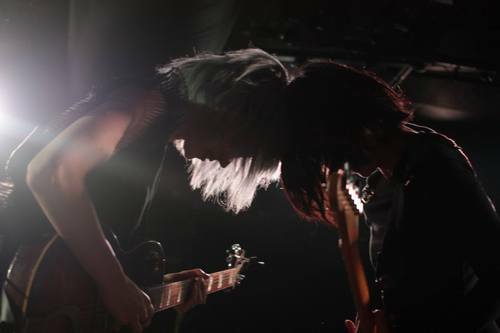 They soaked in our melodies and cheers as they held their heads high – taking a bow with smiles on their faces.